For South Africans, winning the 1995 Rugby World Cup final marked the emergence of the "Rainbow Nation" -- for New Zealanders, it was the day Nelson Mandela single-handedly outpsyched the mighty All Blacks. The Jonah Lomu-inspired New Zealanders were red-hot favourites going into the decider, breezing through the group stages and humiliating England in the semi-finals. In contrast, the Springboks scraped through on the back of an unconvincing 19-15 semi-final win over France, raising fears they would be blown away in the final at Johannesburg's Ellis Park. Then Mandela, in one of the most audacious political gambles of his career, appeared before the mostly white crowd of 62,000 wearing a Springbok jersey to shake the players' hands before kick-off. The-then All Blacks coach Laurie Mains said the entire stadium was electrified at the sight of South Africa's first black president sporting a garment that was indelibly associated with the apartheid regime. 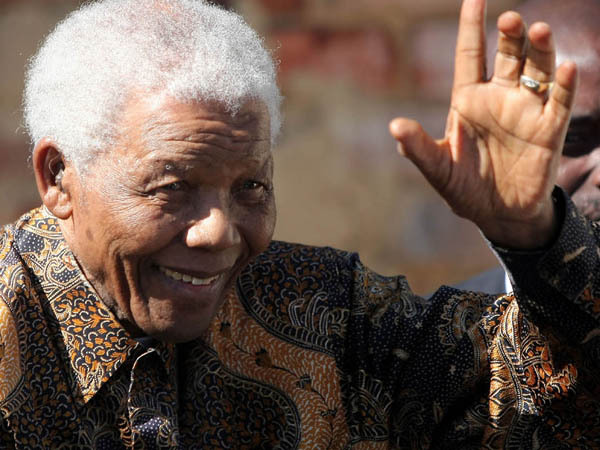 "We had no idea it was going to happen," Mains told AFP, just months before Mandela died aged 95 after a long illness. 'When Nelson Mandela appeared from under the grandstand with a Springbok jersey on, the crowd literally erupted." "When Nelson Mandela appeared from under the grandstand with a Springbok jersey on, the crowd literally erupted." "It was the most awesome experience I've had at a rugby stadium. Clearly it was a huge boost, not just to the crowd but to the Springbok team." Lomu, who was named player of the tournament, said it was intimidating to meet Mandela decked out in his opponents' colours. "It felt like the pressure was all on us because they had Nelson Mandela on their side," he recalled ahead of the 2007 World Cup. They had all their country finally united after years of fighting ... that one day they all came together." At the time, Mandela had been president for barely a year and many whites still regarded him as a terrorist over his support for armed struggle against apartheid. He also risked alienating black supporters, for whom rugby union, and the Springbok jersey in particular, had long been a hated symbol of white supremacy. But on June 24, 1995, the gamble paid off and the chant of "Nelson, Nelson" reverberated around the stands while millions more watched television screens transfixed. It was around that moment -- immortalised in the 2009 movie Invictus, starring Morgan Freeman as Mandela -- that Mains began to believe his team was not taking part in just a simple rugby game. "It was very much more than that," he said. "It was incredibly intense. The All Blacks may well have felt like they were taking on the whole world. "The atmosphere in that ground could not possibly be repeated, ever, because you'd never again get such a great moment in history and such a great man creating that moment." To their credit, the All Blacks maintained their composure to keep the scores level after 80 minutes but succumbed to a Joel Stransky drop-goal deep into extra-time. Mandela then took to the field again, this time to present the William Webb Ellis trophy to Springbok skipper Francois Pienaar. The defeat spelled the end of Mains' international coaching career, but he says he still feels proud to have been on the sidelines as history was being made. "Put the rugby aside, put the result aside for the moment -- I feel deeply honoured and humbled that I was part of such a great occasion in world sport," he said. Nor does he bear any ill will to Mandela, the Springboks' secret weapon on the day, whom he subsequently met when he returned to Johannesburg to coach Super rugby in 2000-2001. "The balance and compassion that that man showed after what he had been through is an example for all leaders in the world," he said. "My everlasting impression of Nelson Mandela is that if we could have a few more of him, then the world would be a much better place to live in."